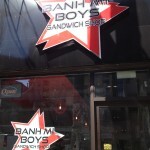 Banh Mi Boys had initially opened for a little while before closing for renovations in mid February. The renovations ran longer than expected which left me eagerly waiting for its re-opening. This sandwich shop, situated at Queen and Spadina, is ideal for take-out as the food is served quickly and seating is limited. Despite being there around 2 for a late lunch, the place was still busy with many folks standing around hoping to snag a table. 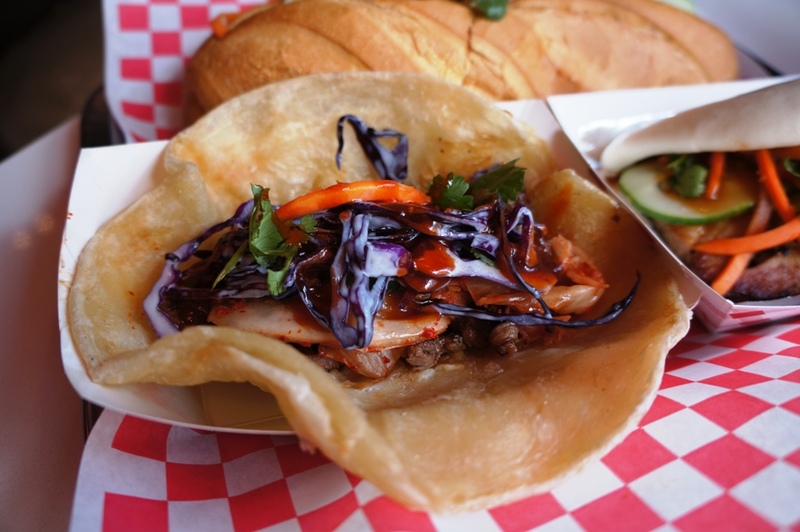 The menu features banh mi, tacos and steamed baos. 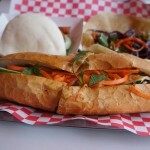 Each of the three items include a vegetarian tofu option. A selection of sides including fries and a jicama papaya salad is also available. Coming hungry, Mike and I decided to try something from each category. 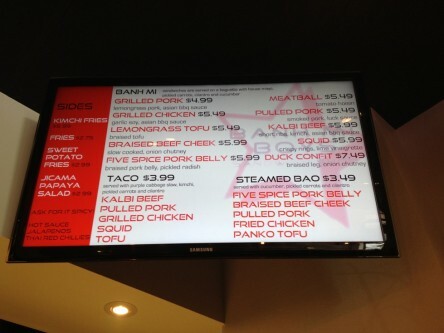 The first thing I tried was the Five Spice Pork Belly Steamed Bao ($3.49). 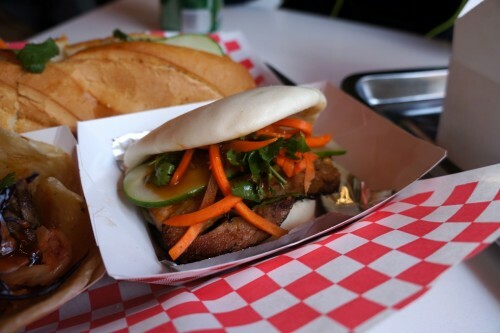 The bao was topped with cucumber, pickled carrots and cilantro which contrasted the fatty, melt-in-your-mouth pork belly nicely. 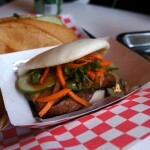 It came with two thick pieces of pork sandwiched between the soft and chewy bun. This ended up being my favourite item we tried. Next up was the Kalbi Beef Taco ($3.99) which was topped with a purple cabbage slaw, kimchi, pickled carrots and cilantro. As it was pretty saucy, it wasn’t the most elegant thing to eat but I was too busy wolfing it down to care. The tacos here aren’t served in a traditional Mexican corn tortilla. 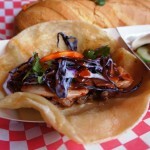 Instead, it’s served up in a chewy, slightly thicker pancake similar to roti or a Chinese pancake. Delish! 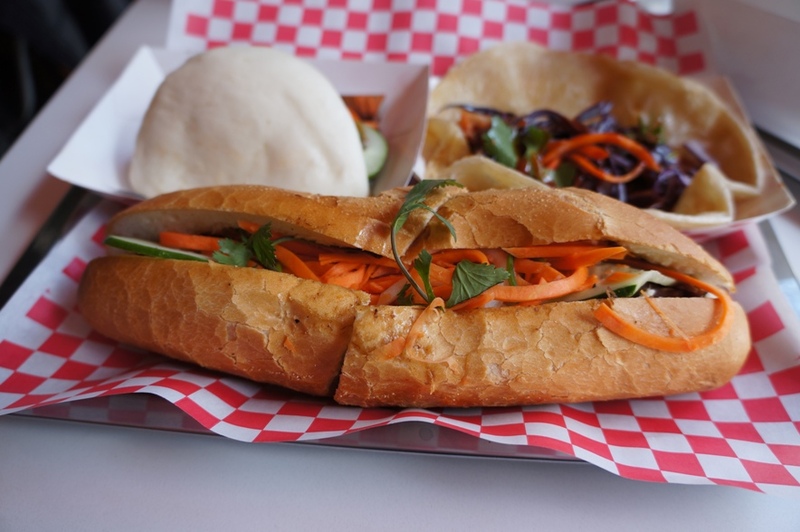 They have a wide variety of banh mi’s ranging from the traditional grilled pork to more unconventional options such as duck confit and squid. 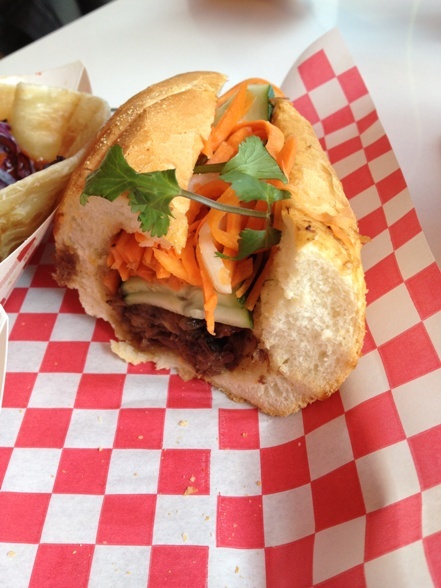 We decided on the Braised Beef Cheek Banh Mi – slow cooked, with an onion chutney ($5.99). The baguette it was served on was particularly noteworthy as it was incredibly soft and fresh. I hate eating banh mi on a stale, crusty baguette which cuts your mouth biting into it. 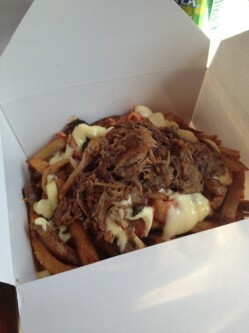 The beef cheeks were tender and the texture of the meat was similar to pulled pork. While I thought the filling was decent I don’t think I’d order this again. 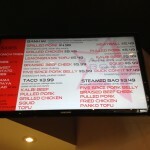 I regretted not ordering the traditional grilled pork. 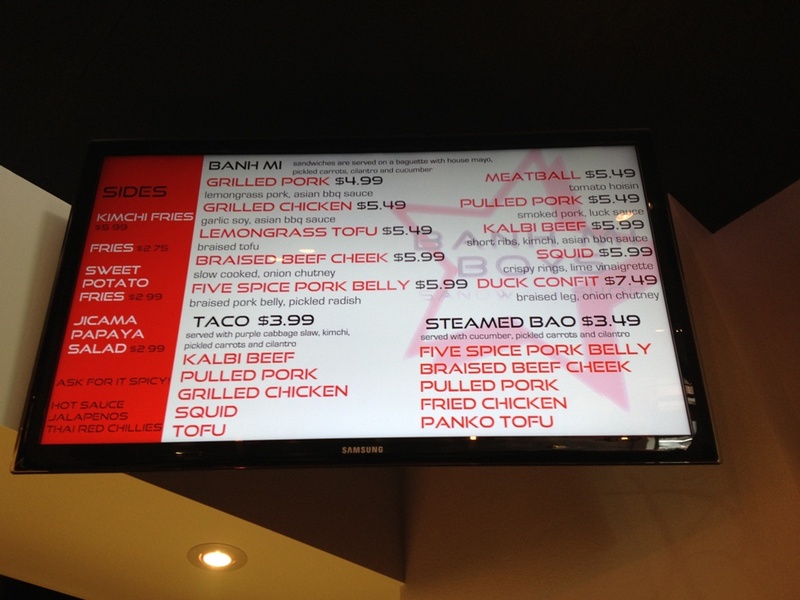 Something on the menu which caught my eye was the Kimchi Fries ($5.99). 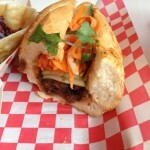 As the price was the same as our banh mi, I was hoping the fries weren’t simply fries topped with kimchi. 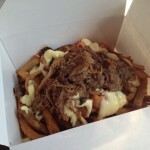 The fries came served in a large box topped with Japanese mayo, kimchi and spicy pork. The tender pulled pork was a welcome addition and the combination of all the flavours was delicious. I’m someone who only enjoys kimchi in small doses so I was glad the kimchi flavour wasn’t overwhelming. Highly recommended! 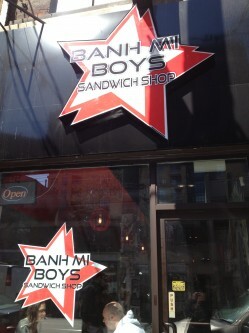 Banh Mi Boys is a great lunch spot. Sure, the prices are a high compared to the other banh mi joints in the area but the prices here are still reasonable and the food is well worth it. Love your photos lady! So bright and crisp 🙂 I really liked the pork belly but found the kalbi dry! Thanks but I got lucky! kalbi dry eh? that’s surprising since the taco I had was pretty heavy on the sauce.